Platinum jewelry can contain different percentages of platinum. Only purchase platinum jewelry from reputable sources that are open about the content of platinum found in their pieces of jewelry, such as deBebians. We manufacture our pieces with 95% platinum content for platinum jewelry. 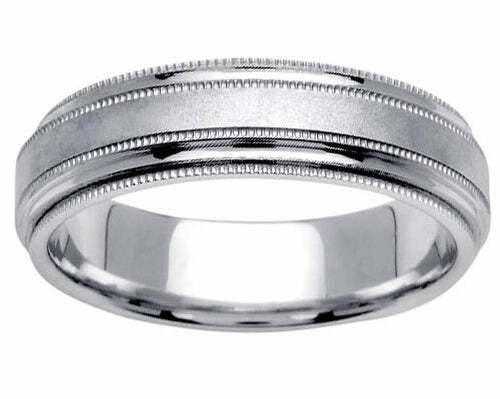 Platinum rings are perfect wedding bands because they are pure white in color. Platinum is a quite rare precious metal that is typically used to manufacture fine jewelry. It is quite dense and its durability makes it ideal for setting fine gem stones and diamonds. Platinum jewelry has become a favorite for wedding bands and engagement rings. Our platinum jewelry is the perfect way to showcase diamonds or other natural gem stones because of the bright white color of this precious metal. Our platinum rings are elegant timeless pieces whether or not they feature diamonds. Platinum jewelry can contain different percentages of pure platinum. All of our platinum jewelry, including our platinum rings collection, is created with platinum 950. Our platinum 950 is 95% platinum and 5% iridium. Iridium is another metal that belongs in the platinum group of metals (PGM).